In the hands of Tridecalogist. Use TB2QA7N to reference this item. 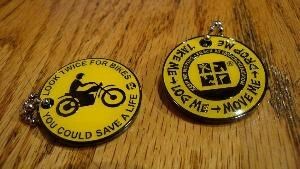 This mission of this coin is to raise awareness for motorcycles sharing the road with other vehicles and to help educate riders about the need to make sure that drivers know that they are there. Don't assume you are visible to a driver. 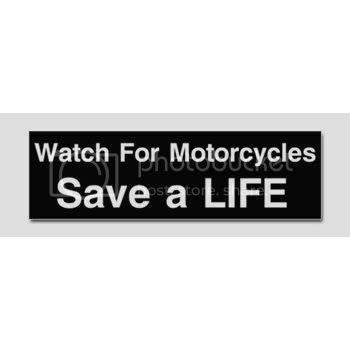 As a motorcyclist, it is your responsibility to make your presence known to drivers. Select and wear an appropriate helmet with retroreflective materials. A DOT-approved motorcycle helmet is your most valuable piece of protective gear and should be visible to drivers. Wear bright, contrasting protective clothing. If you wear dark clothing, wear a fluorescent vest. Proper lane position is important. It helps drivers see you and protects your riding space. Remember, if you can see a driver in the side-view mirror, the driver can see you. Don't "hide" in a driver's blind spot, and always signal before making a move. Remember, there is no one safe place to ride. Use lane positioning to be seen and to provide extra space for emergency braking situations or avoidance maneuvers. Never share a lane with a car. Drivers may not expect you alongside their cars and may not be aware of your presence. Helping it visit Treasure Island. Ok, dropped in this cache in CA! Grabbed this TB at the MOA cache today! Almost mistook this for a Pathtag! Will help this one travel! I think I'll take the coin back home to Minnesota so it can see a little of the midwest. Finally was able to let this go. Thanks!! Found on Leap Year day!